Since chloroethenes, which include known or suspected carcinogens, are widely distributed at many contaminated sites, their microbial degradation has been investigated intensely, and aerobic as well as anaerobic transformation pathways have been described (for a review, see Fetzner 1998a). Linear plasmids have been implicated in alkene and chloroethene metabolism by phylogenetically very different bacteria, such as Mycobacterium strains, Gor-donia rubripertincta B-276 (formerly Rhodococcus corallinus, Nocardia coral-lina), Nocardioides sp. JS614, Xanthobacter sp. Py2, Pseudomonas putida AJ, and Ochrobactrum sp. TD (Saeki et al. 1999; Krum and Ensign 2001; Danko et al. 2004, 2006; Mattes et al. 2005). (XecG = ComA) involved in biosynthesis of coenzyme M, are located on pEK1 (Krum and Ensign 2001) (Table 1). A Fig. 1 Alkene degradation via the coenzyme M pathway. (A): Propene degradation by Xanthobacter sp. strain Py2 (Ensign and Allen 2003). CoM, coenzyme M (2-mer-captoethanesulfonate); 1, propene; 2a, (R)-epoxypropane; 2b, (S)-epoxypropane; 3a, 2-(R )-hydroxypropyl-CoM; 3b, 2-(S)-hydroxypropyl-CoM; 4, 2-ketopropyl-CoM; 5, ace-toacetate. Xamo, alkene monooxygenase; XecA, epoxyalkane:CoM transferase; XecD, 2-(R)-hydroxypropyl-CoM dehydrogenase; XecE, 2-(S)-hydroxypropyl-CoM dehydrogenase; XecC, NADPH:2-ketopropyl-CoM carboxylase/oxidoreductase. 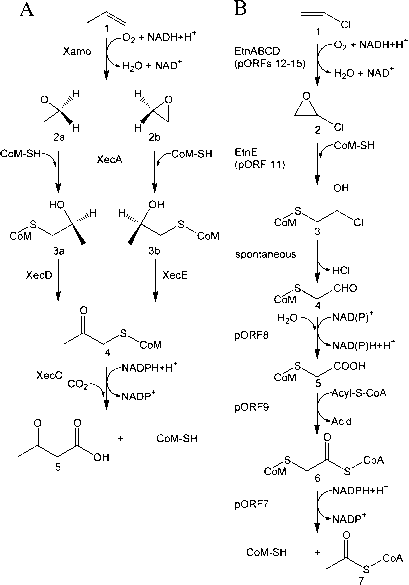 (B): Hypothetical pathway of vinyl chloride degradation by Nocardioides sp. JS614 (Mattes et al. 2005). CoM, coenzyme M (2-mercaptoethanesulfonate); 1, vinyl chloride; 2, chloroepoxyethane; 3, 2-chloro-2-hydroxyethyl-CoM; 4, 2-ketoethyl-CoM; 5, carboxymethyl-CoM; 6, CoM-acetyl-coenzyme A; 7, acetyl-coenzyme A. EtnABCD, alkene monooxygenase; EtnE, epoxyalkane:CoM transferase. For proteins of open reading frames (ORFs) 7-9, see text dichloropropenes to the corresponding epoxides. The alkene monooxygenase genes amoABCD, as well as genes involved in the downstream catabolism of epoxides, are encoded by the 185-kb linear plasmid pNC30 (Saeki et al. 1999). (Chloro)alkene metabolism via coenzyme M pathway: etnEABCD (ORFs 11-15) encoding alkene monooxygenase (EtnABCD) and epoxyalkane: coenzyme M transferase (EtnE), genes for putative CoA transferase (ORF9), putative acyl-CoA synthetase (ORFIO), two putative oxidoreductases (ORF7, xecC-like, and ORF8, xecE-like) [AY772007]. Phthalate and terephthalate metabolism: ophAlA2, (ORFO), ophBA3A4C, ophR, pehA, ptrDABC, tphR, tphAlA2BA4 [AY502076]. Biphenyl metabolism: bphC2 (extradiol dioxygenase). Biphenyl metabolism: bphC2, bphC3, bphC4 (extradiol dioxygenases). Biphenyl degradation: bphC6 [AB117724]; bphC8 [AB117726] (extradiol dioxygenases). Naphthalene, dibenzofuran, and dibenzo-p-dioxin metabolism: rubl, narRl, narR2, ORF7, narAaAbBC (ORF6, dodRl, dodR2, ORF7, dodA, do dB, dodC, ORF8 [ABl 10633]). strains JS614 and Py2 (comA = xecG, ORF6 on the pNoc614 segment; Mattes et al. 2005). When six vinyl chloride degrading mycobacteria, which all possess homologous epoxyalkane:CoM transferase genes (etnE), were screened for plas-mids, large linear DNA elements (110-330 kb) were found in all strains, namely, Mycobacterium sp. strains JS61, JS616, JS617, JS619, JS621, and M. rhodesiae JS60. In fact, almost identical etnE sequences were found in a total of ten ethene/vinyl chloride degrading isolates that were obtained from geographically distant locations. The phylogeny of the 16SrDNA of the strains significantly differed from the phylogeny of the etnE gene sequences (Coleman and Spain 2003a,b), indicating horizontal gene transfer among these mycobacteria. Notably, a recent report suggests that gene transfer may have occurred even between Gram-positive and Gram-negative bacteria. Plasmid DNA of Pseudomonas putida AJ and Ochrobactrum sp. TD was found to contain etnE genes almost identical to each other and to those of Mycobacterium strains JS60 and JS621 (Danko et al. 2006). Based on their behavior in pulsed-field gel electrophoresis, the plasmids of P. putida AJ and Ochrobactrum sp. TD, which are essential for the ability to degrade vinyl chloride and ethene, were reported to have a linear topology. These plasmids, however, appear to readily undergo deletions and rearrangements, depending on the carbon source used for growth; in complex medium, they were cured rapidly (Danko et al. 2004, 2006). Fig. 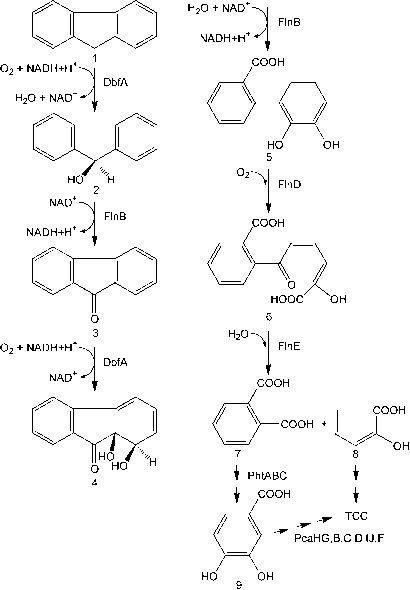 3 Degradation of 1,2-dichloroethane by Xanthobacter autotrophicus GJ10 (Janssen et al. 1985). 1, 1,2-Dichloroethane; 2, 2-chloroethanol; 3, chloroacetaldehyde; 4, chloroac-etate; 5, glycolate. DhlA, haloalkane dehalogenase; Mox, (pyrroloquinoline quinone-dependent) alcohol dehydrogenase; Ald, chloroacetaldehyde dehydrogenase; DhlB, 2-haloacid dehalogenase results in formation of the toxic compound 2-chloroacetaldehyde, which subsequently is oxidized to 2-chloroacetate (van der Ploeg et al. 1994). Strain GJ10 harbors a second hydrolytic dehalogenase, namely, haloacid dehaloge-nase DhlB (Ridder et al. 1997), which converts 2-chloroacetate to glycolate (van der Ploeg et al. 1991). Two chloroacetaldehyde dehydrogenases have been identified: one is encoded by the chromosomal aldB gene, the other by aldA located on the 225-kb plasmid pXAU1 which was shown to be linear by pulsed-field gel electrophoresis (Bergeron et al. 1998). Haloalkane dehalogenase DhlA likewise is encoded by pXAU1, whereas the mox and dhlb genes are located on the chromosome (Tardif et al. 1991; van der Ploeg et al. 1994).